Ecuador Threatens 'Strong Hand' Against Rebels After Confirming Triple Murder : The Two-Way Militants formerly associated with FARC abducted a trio of press workers three weeks ago in the Colombia border region. Now, Ecuador says the workers are dead — and officials are vowing retaliation. 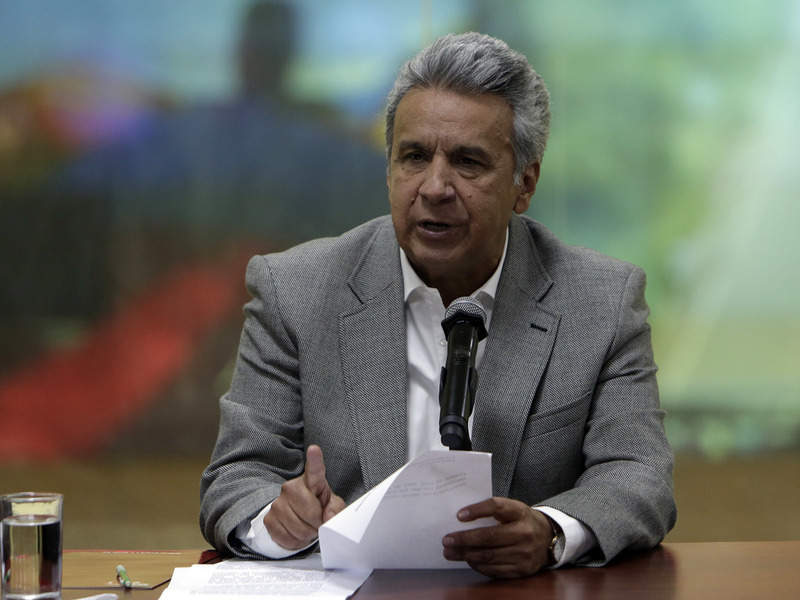 Ecuadorean President Lenín Moreno addresses a news conference Friday in Quito, confirming the killing of three press workers kidnapped along the country's border with Colombia. Three weeks after Colombian militants abducted a trio of Ecuadorean press workers, the president of Ecuador, Lenín Moreno, has confirmed what many in the country had feared: Reporter Javier Ortega, photographer Paúl Rivas and driver Efraín Segarra have been killed by a dissident faction of the Revolutionary Armed Forces of Colombia, known as FARC. Moreno delivered the news in a speech Friday, not long after the deadline he had set for the captors to provide proof of life had lapsed without satisfactory response. He had set the deadline late Thursday after cutting short his trip to Peru for the Summit of the Americas, and he had threatened to "fight them in the realm they have chosen." Now, Moreno has declared that he has "ordered immediate actions," releasing an image of his discussions with Colombian authorities about possible next steps. "I am witnessing up close the suffering of the relatives of Javier, Efraín and Paúl, and I am with them in their pain," Moreno tweeted. "I will keep my word, as always. I will use a strong hand against criminals. I will take care of the country and our peace." Relatives of the three men react in anguish as Moreno confirms their deaths Friday. The announcement marks a grim new development in a story that began March 26, when the three men were kidnapped while on assignment for El Comercio, a Quito-based daily newspaper. The paper says they had been investigating recent violence in the border region of Mataje. Their abduction was carried out by the Oliver Sinisterra front, a former faction of FARC that left the group during the leftist guerrillas' peace talks with the Colombian government. Those talks ultimately resulted in a 2016 peace agreement, which ended more than half a century of war and earned Colombian President Juan Manuel Santos a Nobel Peace Prize — but several smaller gangs affiliated with FARC, including Oliver Sinisterra, refused to follow the group into demobilization and Colombia's political mainstream. "Both the Ecuadorean and Colombian governments have tried to limit the fallout from the kidnapping, with military officials in both countries denying the men were being held inside their territory. "Earlier this week, authorities dismissed as fake a statement signed by the captors claiming the journalists were killed during a military raid coordinated by the two governments." But on Thursday, after a Colombian TV network announced it had obtained graphic photographs that appeared to show the dead bodies of the three men, Moreno canceled his meetings in Peru and flew back to the capital. Now, he has erased all doubt. The country has announced it is deploying elite security forces to the region where the men were kidnapped, and it has promised a $100,000 reward for information leading to the capture of Oliver Sinisterra's leader, a militant with the alias "Guacho." Ecuador "has and will have all of my support, that of our armed forces and the Colombian people," Santos said Thursday, adding Friday that he has instructed his high-ranking defense officials to travel to Quito for further planning. "We condemn these deplorable acts," he tweeted. "When countries work together, criminals always fall." NPR's Nicole Cohen contributed to this report.